Psyche was one of the three daughters of a King. Amongst the daughters Psyche was very beautiful so much so, that she seemed like a goddess amongst mortals and soon became well known for her beauty. Men from far would come to witness her beauty, and soon, people started comparing her with Aphrodite and felt that Psyche was more beautiful than her. When Aphrodite heard about Psyche’s beauty, she was jealous and summoned her son, Eros (also referred to as Cupid in some stories) and ordered him to cast a spell on Psyche, so as to ensure that nobody would want to marry her. Eros flew down to the earth to follow his mother’s instructions. 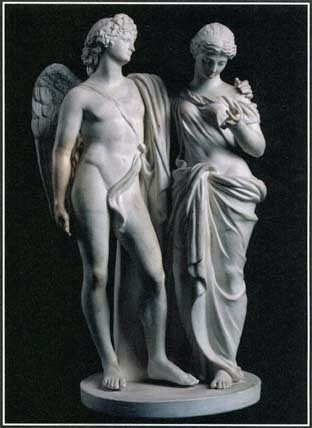 Eros picked up one of his magical arrows (so that his magic could work as per Aphrodite’s desire), but at that very moment she opened her eyes. When Eros saw the beautiful Psyche, he was so moved by her beauty, that by mistake he pricked his own self with one of his magical arrows. As destiny would have it, he fell in love with Psyche immediately. In love, Eros regretted what he had done, so he sprinkled a magic potion on her eyelids to ensure that she found all the love and happiness in life. With a heavy heart, Eros left, but not before doing what his mother wanted him to do, albeit with a heavy heart. Sure enough, as Aphrodite had willed, nobody was willing to get married to Psyche. Her parents were worried that they must have earned the wrath of the Gods, asked an Oracle to reveal her future. The Oracle said that no mortal would marry her, but there was a monster at the top of the mountain who would marry her and that they should leave her there adorned in mourning clothes. Giving in to what was destined for Psyche, her parents along with her, headed for the mountains. When they were close to the peak, a gentle breeze lifted Psyche and took her to the top of mountain. On reaching the peak, she came across a beautiful palace decorated and lit up for a wedding. The palace was all set for a grand princely wedding but there were no guests. Psyche soon realised that there were invisible servants waiting on her and escorting her along. At night, when it was very dark, she felt the presence of a prince. The prince was very gentle and nice and assured her that he would love her no matter what. He was very romantic and Psyche instantly fell in love with him. But the prince made a condition, that she should never insist on seeing him, and if she did, he would have to leave. Psyche started living a life of romance and was happy in ignorance, that the Prince was none other than Eros himself. Needless to say that Aphrodite was not aware of all this and Eros was happy with this arrangement. But during the day Psyche would feel lonely and started missing her family members. She pleaded with Eros, to allow her to get her sisters to visit her. Though Eros warned her that it would lead to trouble, Psyche would not hear, and Eros gave in to her request. When her sisters saw her opulence, they were jealous. When they came to know about Psyche’s unique relationship with her ‘husband’ and the fact that she had not even seen her husband, they were even more worried. They revealed to her about the Oracles prophesy and convinced Psyche that her lover was a monstrous creature. Psyche was falling prey to all this and one night agreed to check out on her husband as suggested by the sisters. On the fateful night, Psyche went to bed with a candle and a dagger. If she found out in the light that the Prince was a monster, then she should kill him with the dagger. But in the light of the candle when she saw that her husband was the most handsome young man in the world, she was happy. In her delight a drop of candle fell on Eros who woke up to find Psyche staring at him. A disappointed Eros left the palace saying where there was no trust, there could be no love. Psyche pleaded with him, but it was too late. Psyche, was not willing to give up and decided that she would get him back, no matter what she had to do. Aphrodite soon learnt about her son’s disobedience and decided to punish Psyche by making her suffer. Psyche by now had offered prayers to all gods to help her, decided to approach Aphrodite directly. This further infuriated Aphrodite, who decided to put her through trouble. On sighting Psyche, she dumped a pile of seeds of different kinds and ordered her to separate then by sundown. The pile would have taken Psyche hundreds of years to sort, but moved by her beauty; hordes of ants came from nowhere and did the job in no time. On seeing the work done meticulously, Aphrodite decided to give her a much tougher job. This time she ordered her to collect wool from the fiercest man-eating sheep that lived in the midst of the thorn-bushes near the river. 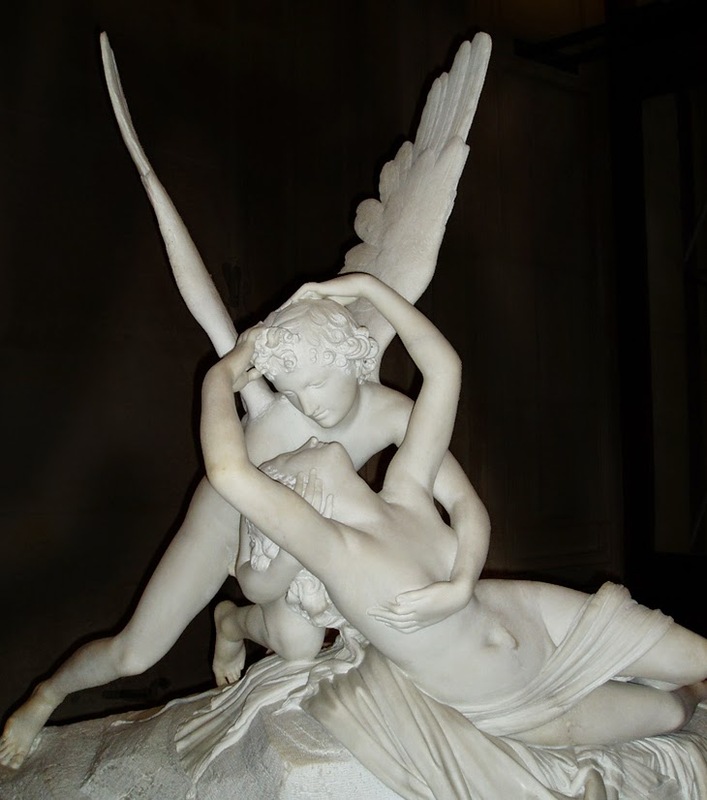 Psyche knew that attempting it would mean sure death, but she decided to do this for her love, even if it meant death. When she reached close to the thorn-bushes, she heard a voice which told her to wait till it got dark, when the sheep would leave the bushes and she could collect all the wool that was stuck on the thorns. When Aphrodite saw the wool, she was very angry with Psyche’s success. Aphrodite knew that she had been helped by some force, as both the tasks were beyond the might of a mere mortal. Aphrodite then decided to test her once again. This time she was asked to fill a jar with the dark waters of River Styx from its source, which was from a huge waterfall. This was an impossible task, as the source was high above a mountain peak and it would be impossible to reach up there, as the rocks were steep and slimy. But as always, she got help here too. An eagle, supposed to be that of Zeus, took the jar from her hand and flew up to the source and returned the jar to Psyche. the way to the Underworld, she got advised by a voice from a tower, which told her exactly what to do. In the earth, she would find a hole and deep inside she would find the river of death. 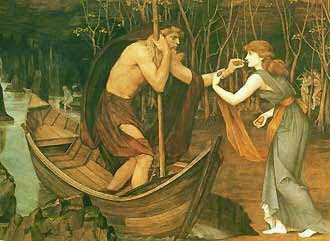 There she would have to give a penny to Charon, the ferryman who took the dead to the other side of the river. She was advised to carry some bread with her as Cereberus, the three headed dog which guarded the doors of the Underworld could be appeased only by that. Everything went as advised, and soon she got the box with the potion and was on her way back. But yet again the advice of not opening a box given to a woman, failed (This is Utkarsh Speaking: The Gift of Fire)! Psyche decided to see and probably use the beauty potion for herself. When she opened the box, she found it empty, but as soon as she opened it, she passed into a deep slumber. Eros who had been silently helping Psyche right from sending the ants and advising her at each step decided that Psyche had gone through enough. With one of his arrows he revived her and sought the help of the gods, to win his love. Zeus, who was aware of everything, said that Eros had proved his love for Psyche time and again and Psyche too had reciprocated by being patient and obedient in love, and decided that it was time to unite them. Since Psyche was a mortal and could not live with them like one, she was given the ambrosial nectar of the gods which made her one of them. Aphrodite was no longer jealous of Psyche as she didn’t resent a beautiful goddess and decided to bless the union of Eros and Psyche. This love story of romance, patience and perseverance has given rise to many a well-known story in later times, the most famous being, ‘Beauty and the Beast’. One more tomorrow for the Valentine Day! Keep reading! !